What is the very first thing that comes to mind when you hear the word agreements? You probably might think of two individuals or two parties. 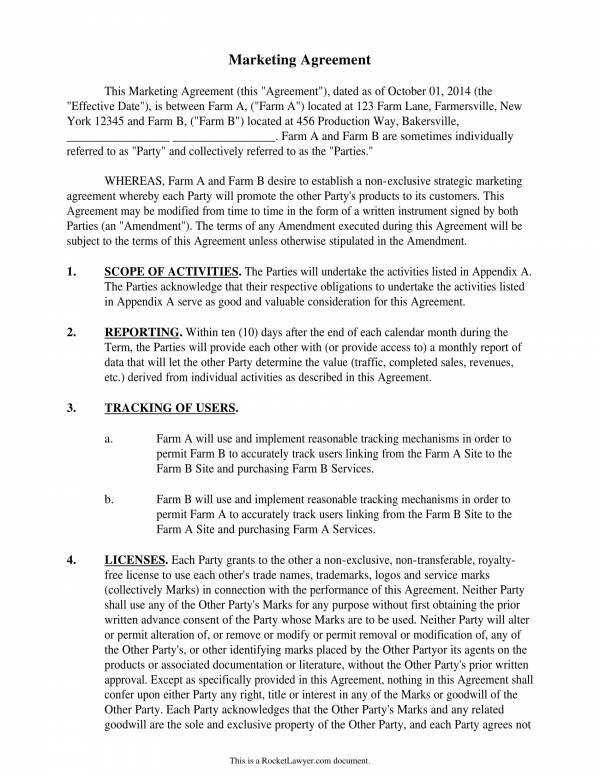 Agreements are formed when two or more parties agree about the same thing. The agreement could be anything from business down to personal matters. 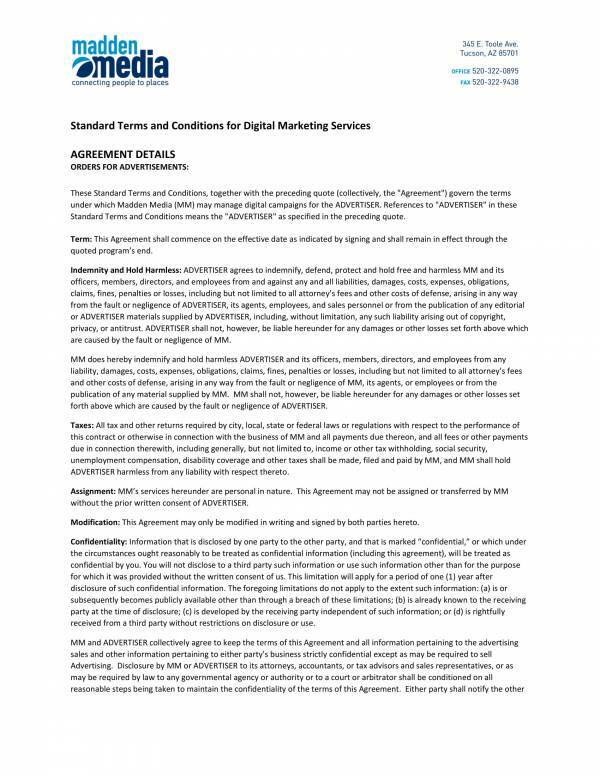 In this article, we will be defining what a marketing service agreement is. We will also learn about its uses, the information included in it and the elements that makes an agreement valid. 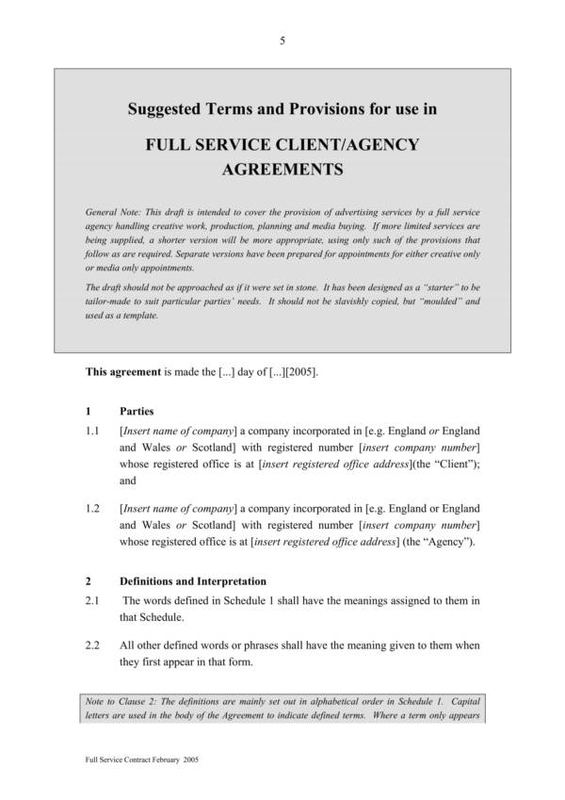 We have also provided sample agreement templates that you may view and download for free to serve as your reference and help you understand more about agreements. 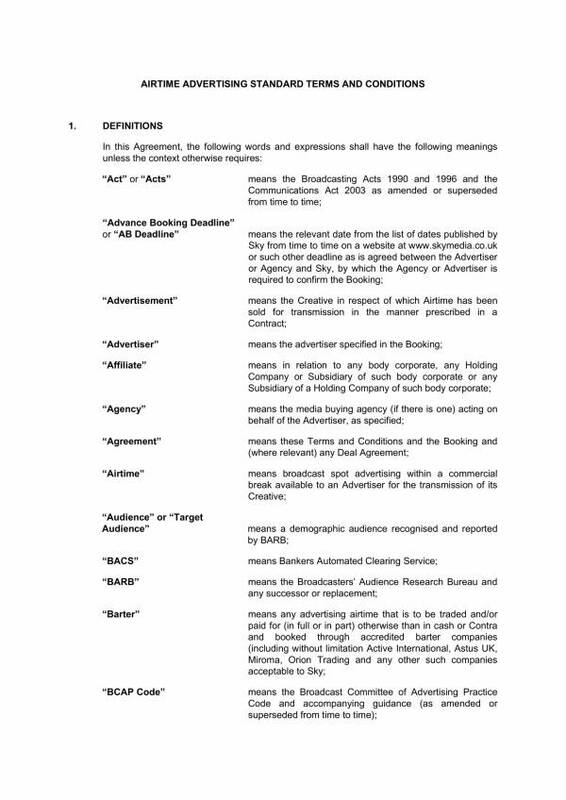 What Is a Marketing Services Agreement? 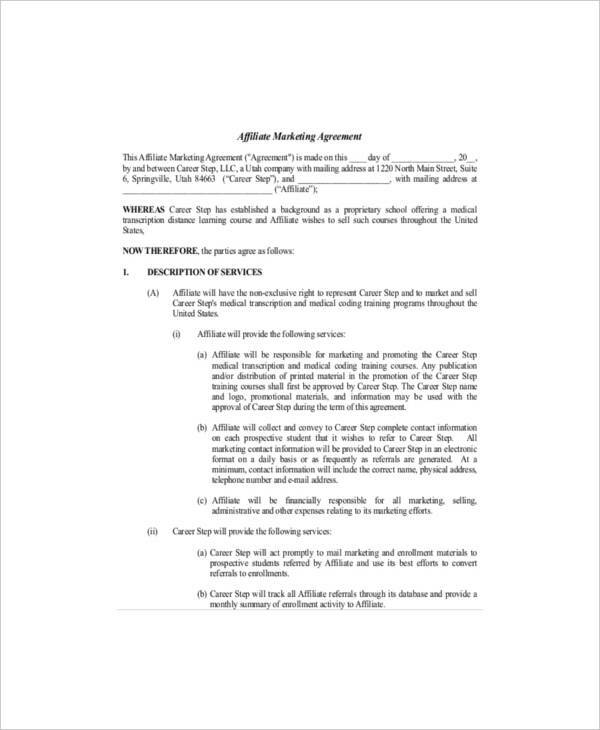 A marketing services agreement is an agreement between two parties wherein one party agrees to do the specific marketing tasks of the other party. 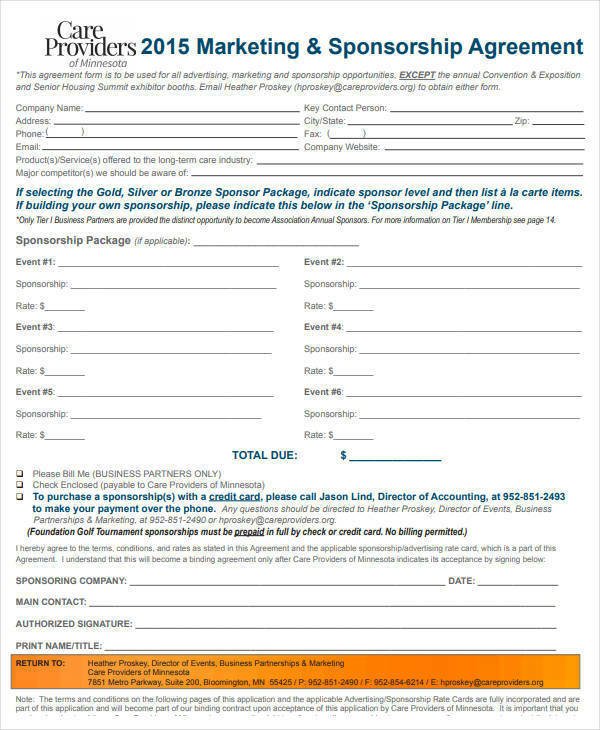 Businesses offering to do marketing services for other businesses who lacks people to market their products and services, as well as those business who does not have a marketing team of their own. The marketing services included in the agreement, includes creating an online presence for a particular company, designing marketing and advertising materials, writing marketing plans, building a marketing campaign for a new product, etc. 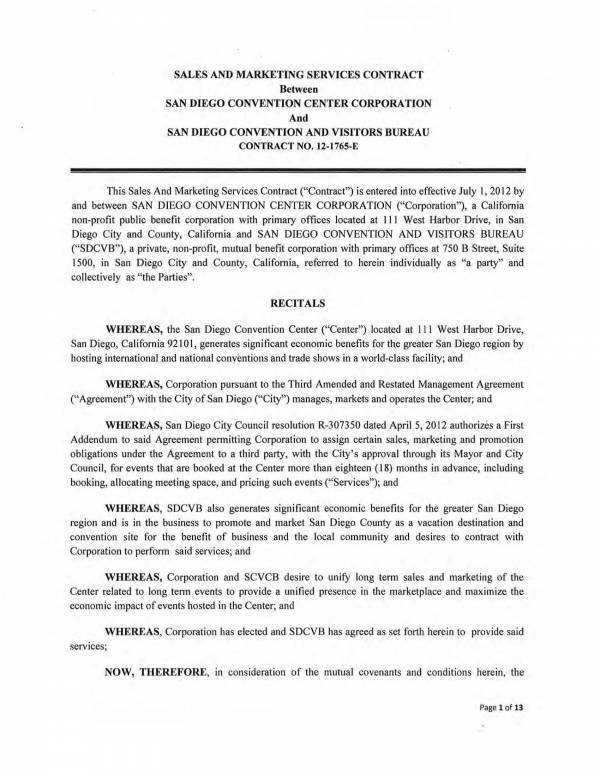 Marketing services agreements must be created whenever a business transaction is conducted by the company or business. This is to ensure that the entire transaction is discussed thoroughly and all the details are recorded. The record of these details then becomes the basis for the creation of the final agreement document. The final agreement document must be detailed, clear and concise so that it will be considered truly effective and reliable. Of course, nobody wants to be a part of an unreliable and doubtful agreement. 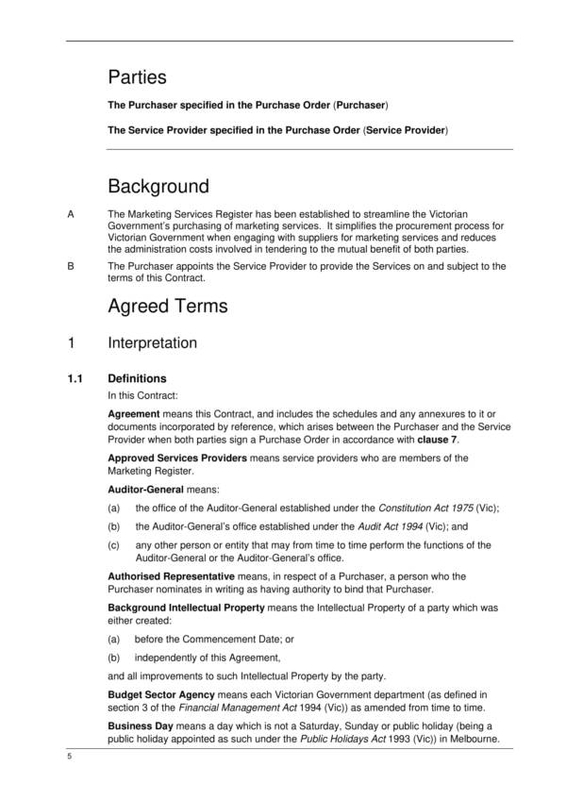 Part of the details recorded in an agreement are the names of the participating parties, namely the service provider and the customer. Aside from identification of the parties, the agreement binds these parties to the provisions or terms an conditions of the agreement. This means that they are obliged to do their share of responsibilities while the agreement is ongoing, as well avoid doing the things that they are limited or not allowed to do. If in case they violate any of the provisions stated in the agreement, they will incur a breach and must take responsibility for their actions by providing the agreed compensation. The compensation paid is calculated based on the cost of the damage brought about by the breach. The actual date when the actual services will be started, the duration of that particular service, and the exact end date of the agreement. List of services requested by the client. The mode of payment, including the amount to be paid, additional fees, payment frequency, etc. Related and applicable agreement clauses, like confidentiality clause, early termination clause, etc. Contact details and addresses of both parties. 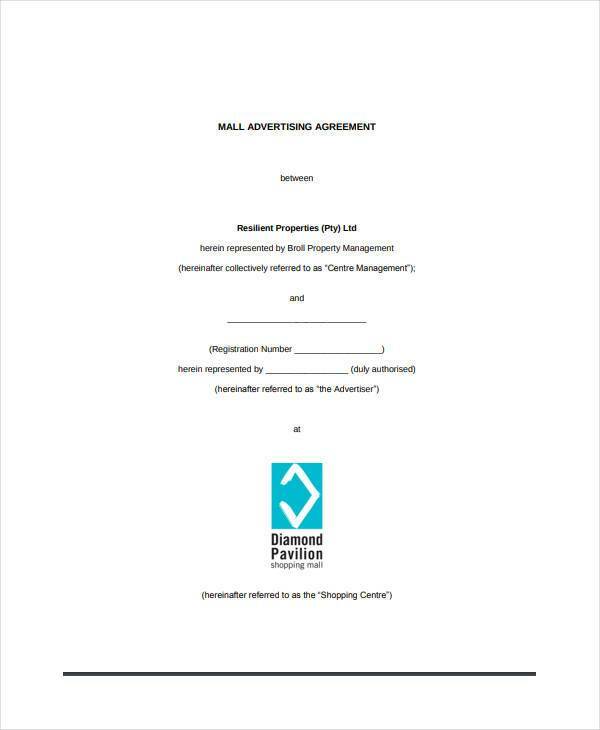 Other related topics you may find useful are Marketing Agreement Samples and Templates, Joint Marketing Agreement Samples and Template, and Indemnity Agreement Samples and Templates. What Are the Elements That Make Up a Valid Agreement? An agreement is not valid by default, but it becomes valid only if it contains all of the elements of a valid agreement. Why is there a need for these elements to be present? It is because these elements hep regulate agreements to ensure that every detail of the agreement is with the law and not against the law. Another reason is to prevent instances where one party takes advantage over the other. Fairness is important in an agreement and all parties involved must have equal rights and responsibilities. To be able to further understand what they are, here are the elements of a valid agreement. The very first step taken in the creation of an agreement is offer and acceptance. This simply refers to the offer made by one party that is accepted by another party which essentially forms the agreement. How else do you think would an agreement be formed? 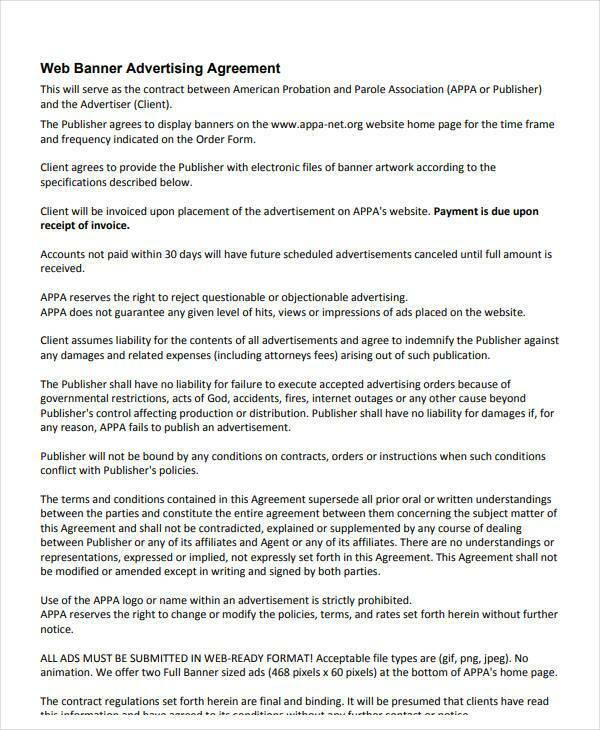 Since we are talking about making an agreement valid, it is a must that the offer and acceptance are also valid. An offer for smuggling and selling drugs that is accepted by another party clearly is not the start of a valid agreement. After the offer gets accepted, the agreement is formed and the discussion for all the other contents and provisions follow. No agreement can be created without this essential element. What does this mean? Mutual consent means that there should be a meeting of the minds. The participating parties must agree to the same terms and conditions of the agreement at the same time and at the same place. If this element does not exist, then you know well that the agreement cannot be considered valid. The intention to go to court is a legal obligation that one must accept if they get into an agreement. Joining an agreement with the intention to go to court means that you are serious about you are getting yourself into, which s very important in business and commercial transactions. While the intention to go to court may not be that important in social agreements, it is a necessity when it comes to commercial agreements. Without it, the agreement is cannot be valid. A consent by one party to join or enter into an agreement takes place when they are not forced to join the agreement, when their is no coercion, when there are no mistakes, when facts are not misrepresented, when the party is not wrongly influenced, if it is not fraud, and when the facts are not mutually mistaken. These are the conditions of a free consent. It simply means that one party should not be forced to join an agreement through any means. They must join through their own free will. Any party who joins or wishes to join an agreement must be competent to join one. This is one of the requirements to be considered a participant and is essential for any valid agreement. What does it take to be considered a competent party? Anyone who gets involved in a legal agreement must always be of legal age as this gives them authority to make credible decisions on their own without their parent’s consent. This also means that they are in the right age and are prepared to make reliable decisions. The next requirement would be having a sound mind. This means that the individual must not have any mental disabilities or disorders that could hinder them from making sound decisions. The last requirement is that the individual must not be disqualified by the law to enter into any agreement. Anyone who conducts a business and enters into an agreement with an incompetent party or entity will surely be putting themselves into trouble, or worse, legal liabilities. If an individual does not meet the requirements of a competent party, then the agreement they are in is invalid. Remember that an offer should for an agreement should be one that is not against the law. An example has been cited above that an offer to smuggle and sell drugs that is accepted by another party makes the agreement invalid. Why is this so? It is because smuggling and selling drugs is against the law or is unlawful. In order for an agreement to be valid, the object in the agreement must be lawful. Being lawful means that the agreement must not be fraudulent, it must not be immoral, it must not not have any legal flaws. When a party gives something to another party in exchange of something with the same value or importance, then this is what is called legal consideration. Legal consideration means getting something in return. If only one party gives and the other party just receives without giving back, then it is already taken as a gift and an agreement will cease to exist or will be invalid. Different countries have their own list of agreements that have been declared void. If you enter into an agreement which has been declared void by the country where you had the agreement done, then there s no way for the agreement to become valid. These agreements include those that limit certain forms of trade and if the agreement is not in the public’s interest. The promises or provisions in an agreement should be those that can be performed. Promises or provisions in an agreement that are impossible to do or perform makes the agreement valid. This is regardless of both parties know of this, or if only one party knows about it. Nobody wants a vague and unclear agreement, that is because those things makes an agreement invalid. A valid agreement must be clear and concise, must be certain about what it exactly wants. The aim of an agreement should be to make things an understandable for the parties involved and not create confusion or uncertainty. There are mainly two types of agreement and they are verbal agreements and written agreements. Verbal agreements are mostly used in social transactions that are not legally binding. Written agreements are used when there is a need to record and document one’s promises to do something as a form of consent and proof. 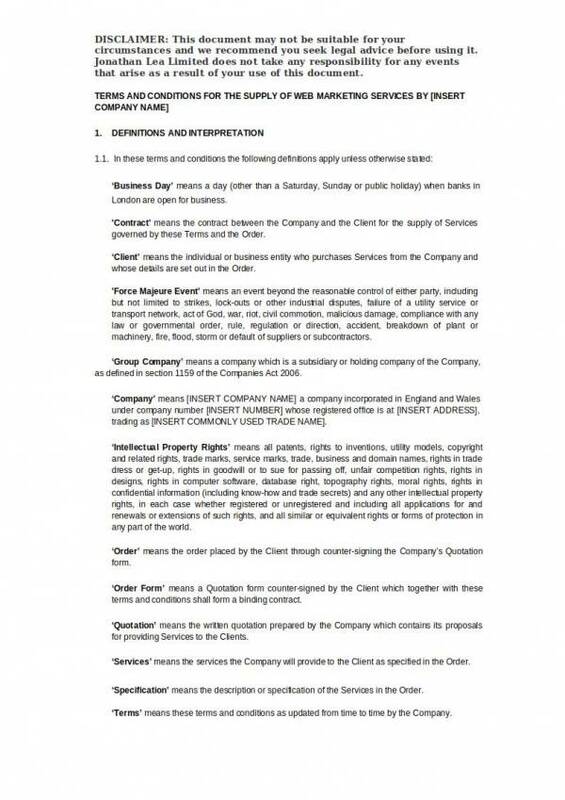 Both agreements can be valid depending on certain requirements. If there are statutory requirements for an agreement to be put in writing, instead of having a verbal one, then this must be followed. If the law requires the agreement to be registered and witnessed, then this must be done. If not, then it will not be enforceable and will be deemed invalid. Be sure to be familiar with these elements as they can help you identify any faults in an agreement that may cause it to become invalid and prevent yourself from getting involved in legal problems brought about by an invalid agreement. You can practice identifying these elements on sample templates that you can download online. If you need references, you can check out articles, like Terms of Service Agreement Samples & Templates, Enterprise Agreement Samples and Templates, and Service Agreement Templates and Samples.